In 1999 Apostle David Watkins began to feel in his heart that God was about to move in an unusual way. He asked specific families to pray and seek Gods will about a possible move from the Midwest to the West Coast. While praying and seeking GODs will concerning this move, the Holy Spirit impressed upon Apostle David’s heart that the churches that had been established in Chicago and Detroit would relocate to San Diego California. 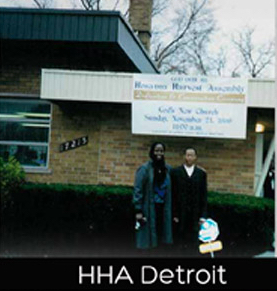 These churches had been established under theDorea Chara Miracle Ministries (DCMM) in 1996. 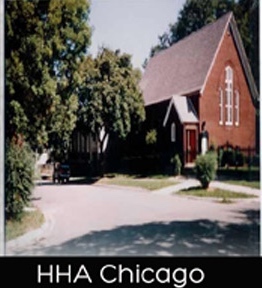 Pastor Deborah Williams, Pastors Peyton Harrison Jr,, Pastor Jerri Harrison, Minister Deborah Tate and the saints had made their exodus from the AME church denomination in 1991. This message gave substance and spiritual direction to prepare the saints hearts for a mighty move and relocation by GOD. Much Prayer, fasting and crying out to the Lord went forth as we prepared our hearts by faith for the unknown. You can pray and have faith, but “works” must happen. Therefore to move quickly andinwisdom there were meetings to discuss the concerns of the people, trips were made to San Diego to secure housing, jobs and other necessary logistics. The “wave” of GOD began to grow with excitement and Gods people began to move by faith! The church buildings that had been purchased in both cities were sold, furnishings were packed up and relocated to San Diego. About 40 Families began selling their homes and possessions to provide the finances to move cross-country in 2001. Saints made the arrangements to retire from jobs, transfer their job or quit and trust GOD for new jobs in California. During this move, the Prophecy came forth that “Gods people would be blessed three and four fold for their sacrifice and obedience in moving”. THAT PROPHECY CAME TO PASS! One by one the families, helping each other, transitioned to San Diego. Temporary transitional housing was established to make the move to the West Coast as smooth as possible. The first arriving families became the welcoming saints that greeted the others as they arrived, family after family came with successful praise reports of how GOD had made a way out of no way. of New York on 9/11. The saints rallied in prayer and thanksgiving and NEVER wavered from the calling but persevered in transitioning to fulfill the vision at a time when our country was experiencing such great devastation and turmoil. 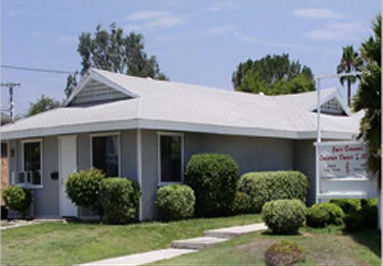 Our first West Coast worship service began in Jamul, California in Pastor David Watkins home in 2001 and the birth of Grace Covenant Christian Church of the Harvest came forth! 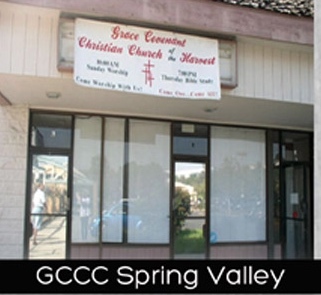 As more families arrived a small storefront property in Spring Valley was rented in 2002.
into a church in 2003. 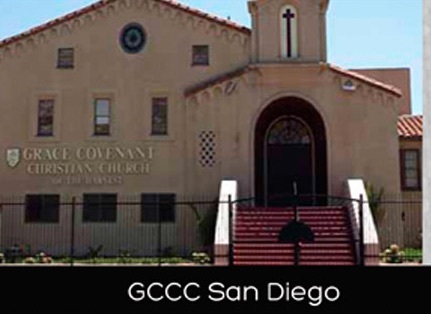 As God continued to “add to the church daily such as should be saved”, we outgrew the Santee church and by Gods grace and mercy we purchased the present location in 2006 at 2885 Clay Ave in San Diego! It is at this current place where the spirit of GOD has exploded and expanded the ministry to reach hundreds for Christ, through our anointed Drama and Dance ministry, our Worship and Praise, honoring the Lord in our Giving, our San Diego4Christ Outreach ministry but most importantly our UNITY in Christ! KNOW that GOD IS OVER ALL!